Last night, my football team kept on recurring in my dreams. I wasn’t really aware the season was ending and that once it did; that was it for me, the end. Yesterday, I was not even aware when it became truly apparent during my last match. But now that I’ve been dreaming dreams about playing with them all night, I finally realise that I won’t be doing it with them again. Maybe I’m too sentimental and that strengthens the feeling; I’m feeling kind of sad, but I’m also happy looking back. In 2012, just after returning home from Hungary, I got an email that informed me football practise would start in about one and a half weeks. It could not start earlier because the trainer and most of the players were still on vacation. However, those who were already home could train together with the MA1, the team above ours. To be honest, I always loved playing football. It was the one thing my friends and I continued doing throughout the years of primary school. Most of my friends were a member of a football club, nearly all young boys are, and their parents often opted for me to join too. I never did because I was afraid I wasn’t good enough. After primary school, I didn’t because I no longer knew anyone, and, besides, wasn’t I too old by now? I finally decided to try it out when there were no other sports I was interested in anymore. When I received that email, I wanted to avoid going by using poor excuses. I am still on vacation. But you aren’t. I have other things to do. No, you don’t. My mom, on the other hand, responded very enthusiastically. Okay then, I really have to go. Instead of leaving my street I took the ‘walking’ path in between the houses to avoid anyone from seeing me. Nearly two streets further I slowed down, dreading, and as I did I thought: why did I sign up? It is going to be horrible. I will do horribly. It’s funny because I actually kept on taking this route the entire year. Looking back now it seems incredibly silly. After making it to the club, I remember meeting Fatima and Loïs, the only other players from my team, and how we initially were waiting on the wrong field. As we approached the large group of girls from the MA1, I noticed most of them weren’t wearing football shoes. The trainer, a woman, told us we were going to work on our condition first. It was a very hot summers day, but this did not stop her from making us run laps around the field. I believe it came close to running for 10 minutes, three times. In between the running, we passed the ball to each other as some sort of ‘break’. Luckily for me, this wasn’t so bad. No one could tell I couldn’t do anything with a ball and I actually already had some condition. “You were almost invisible,” my dad told me after the first match. Oh, are you supposed to want the ball? (I’m just kidding of course.) The first half of the entire season, I dreaded the matches. I wanted to play- don’t get me wrong, but I simply felt too nervous and like a burden to the rest of the team. The training, on the other hand, was great! Marcel ensured training was a lot of fun, to me anyway. For some of the more experienced players, it eventually wasn’t challenging enough anymore, or perhaps it hadn’t been from the beginning. The motivation in our team dropped near the end of the season and I think we ended up short in players. Looking back this might not have been the best season, but it was great for me because it gave me time to learn as a beginner. The team was always very encouraging and helped me with their coaching. They were always patient, especially our captain. 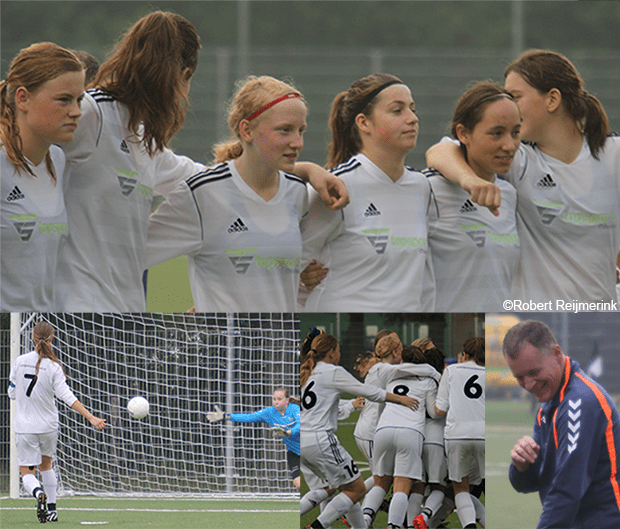 One of the final things we did that season was participating in a local tournament, ‘de Hengelose kampioenschappen’. In between our matches, Esmee and I sat down in the shadow while watching one of our opponents matches. We were reflecting back on the season and football in general when she said to me: “I have never seen someone improve so quickly.” It made me feel really good. At the end of summer, I was completely ready for the new season. Most of us went to the MA1 where we merged with a few of last years MA1. We were getting a new, very serious trainer, who most of the players already knew. We got training suits and a sports bag, all with our own number, and even had to sign some piece of paper that ensured we would return them once we left the MA1. To get some condition, players from both our team and the team above us went jogging. Despite our motivated start, and just as we were about to start the season, our trainer had to quit. This is when René became our trainer and remained for the coming two years. During the first training, he wanted to get some things straight. Did we know the meaning of certain football terms? Marleen did. Some others knew as well and then the rest simply agreed, but I’m not sure if I did actually know. Shhh, that’s a secret. Unlike the trainer we were supposed to get, René is very calm and coaches in a positive way. In my opinion, he brought something new. All the current trainers had already trained girls before, whereas he previously trained boys instead. On top of that, he is very fanatic, progressive and puts a lot of effort into us. Nevertheless, I became nervous again before matches. (Yes I know it must be very tiresome to hear about my insecurities again, but believe me, there is no one who dislikes it more than I do.) During the first half of a match I would beat myself up by talking myself down and I noticed every single mistake I made. The players from last years MA1 were very much ‘into the game’ and were not shy to coach us when it went wrong. Somewhere halfway during a first half I had trouble breathing because I got so caught up in my own head. The only way I can control these things is by my breathing, but this cuts down half of your breathing capability in the field, yet you’re still playing. The breaks help me regain control; the second half was always better. Halfway through the season, a conversation with René made a permanent change for me. He made me realise when I’d forgotten once more, that it is okay to be who I am. It doesn’t matter if I don’t say much and it is okay to enjoy conversations even if you don’t say a word, because it can also make me happy this way. Everything became better as the season progressed and by the end of it I couldn’t believe the season had already passed. Just like last year, I could not stand the thought of going without football the entire summer vacation. In fact, how did I go without football most of my life anyway? As I’m typing this I also literally cannot fantom how we are again, at the end of a season. It feels like yesterday that I was passing the ball with Jessie while we talked about our new educations near the end of the summer. And this year, when did 2014 change into 2015? How did the winter pass by so quickly? Weren’t we still supposed to have half a competition left? I can’t complain though. I have played way more matches than I could have hoped for. The restraint I felt in the beginning towards the team above us, has by long vanished all together. I ‘frequently’ played matches with them before, but at some point during this season, I joined nearly every match. “You should come play with us instead,” they repeatedly told me then, or: “Join us every week.” To be honest I got the best deal this season. I could play with my own team and theirs. The atmosphere in both and the continuous support and encouragements from the players are amazing. The teams themselves seemed to have become closer as well, especially my team. A particular match everyone remembers is the second match in the first round of the cup. In the 96thminute we took a corner. Of all people, our keeper, headed the ball in the goal resulting in penalties. Our stood in one line as we watched one of us take a penalty and our keeper defending the goal. The bliss after the victory was immense. Another match I enjoyed a lot took place during the winter competition. Lauren had a new haircut, 2 players of the MC1 reinforced our teams and Esmee scored a phenomenal goal in the last minute, leading us to a 2-1 victory. Recently we played in the semi finals. It was kind of a big happening and very nerve-wrecking. Quite a few parents travelled with us for support and it felt so incredibly good when we won. At that moment I felt so grateful for being together with my team. It is not just football that I should be describing. Football and this club, this team, became a big part of my life and so my life next to football is unmistakably intertwined. I could three double the length of this post. The players, trainers and parents showed me it is okay to be myself by being as accepting and open as they are. They helped me learn and grow as a player and encouraged me, always. I have long been searching for myself and up till this year I only felt like I could be that person and feel that happiness when I am around Verena, a friend who lives 7 hours away in Germany. But now, sometimes on the football field, there are these little moments in which it shimmers through too. Apart from the first paragraph, I had already written this on Friday. Yesterday we played the last competition match of the season and this was the last match for me altogether. Frankly it was the something like the worst match we’ve played in the last two years and frankly I was also the worst player of the entire match. Luckily I don’t care all that much. It happens, you know. What I wasn’t prepared for was getting substituted 5 minutes before the end of the match. Especially because the entire team started to applaud. I almost thought it was a mistake or something till René walked up to me to shake my hand and to give me flowers. As if that wasn’t enough, they gave me three presents and a card after the match. I’m not going to make this any longer. 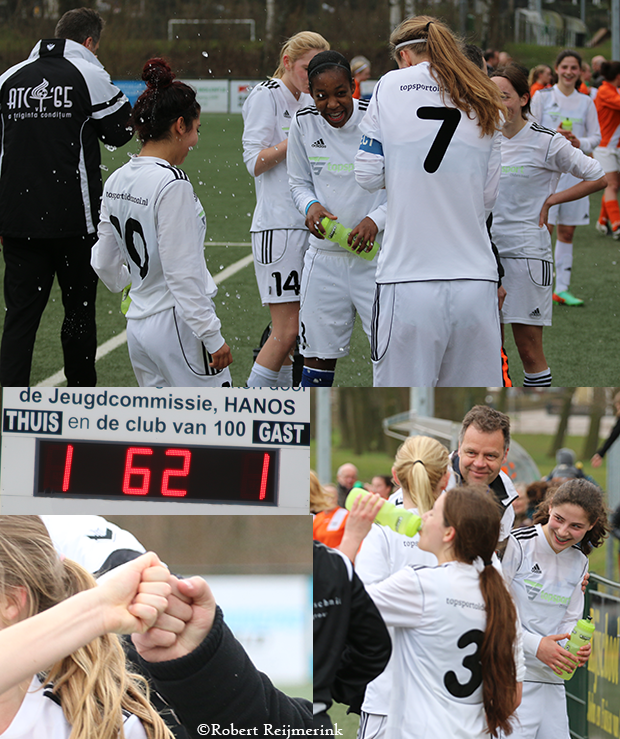 All I can say is: thank you, to my team, René, Peter, Marcel, the Vrouwen1, and all the parents.